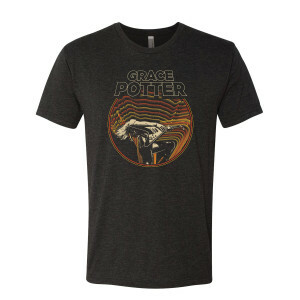 Vintage black tri-blend tee featuring the Grace Potter Repeating design on front. Love this shirt, but one reviewer said it ran small. Not true. Runs true to size. Bummed I have a great shirt that is really a little too big. Good looking design and a really comfortable shirt. But like most band merch the shirt runs small. Support your favorite artist! Go to a show and buy some merch!